Van rentals, convertibles, luxury cars, SUVs and sports cars are some of the most popular & highly rented categories at the Lihue Airport. Rent a car for Lihue Airport in just three quick steps - search, compare, reserve! Cancel your Lihue Airport car rental for free, up to 48 hours before the pickup time. USA Cars rental works in association with leading car rental suppliers to provide top Lihue Airport (LIH) deals and discounts to travelers, seeking low priced car hire services. Car rental at Lihue Airport gives you comfort of commuting from this airport to your preferred destination in time. Rent a car at Lihue Airport to plan your itinerary as per your schedule. Our Lihue Airport car rental deals also cover major car hire inclusions like unlimited mileage, customer support, roadside assistance, road fund tax, liability insurance and more. Lihue Airport is situated on the southeast coast in Kauai County region on the islands of Hawaii, USA. The airport’s runway is well equipped to handle planes up to the size of a DC-10. It is a unique airport as it is an open and un-walled facility. The check-in counter of the airport is also in the open. This airport facility is primarily used by tourists visiting Kauai. You can reach the airport by the Ahukini Road, which extends from Kapule Highway. If you are tourist and looking for the best mode of transportation to travel anywhere to and from the Lihue Airport, then a car rental at Lihue Airport is recommended. If you are feeling hungry and want to gorge on some delicious food, then there are many food joints in the airport premises. 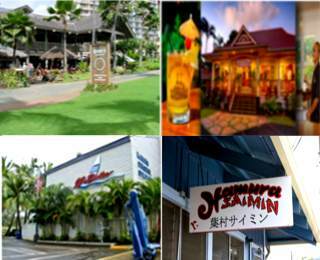 These restaurants are located beyond the security area. The Newsstand at the airport will help you stay tuned to all the worldly affairs and happenings. Public parking is also available at the airport. Lihue city is known for its stunning beaches, adventurous water sports and the great Waimea Canyon. Book your Lihue Airport car rental service now! This Hawaiian restaurant specializes in fresh salads and seafood. Scrumptious Thai cuisine and wines are served at this restaurant. Located by the beach , this restaurant serves grilled meat and vegetables . This Restaurant specializes in dishes prepared with noodles.